Step 1: Turn on the scanner by pressing down on the ‘M’ button on the bottom of the scanner, until you see a green light appear at the top. The ‘M’ button’s blue light will flash slowly. Step 2: Scan the barcode below to place the scanner in pairing mode. Step 3: From the Android device, navigate to Bluetooth Settings. Find the CS3070 in the device list, and then tap the scanner to connect. Step 4: It will ask you to enter a code. 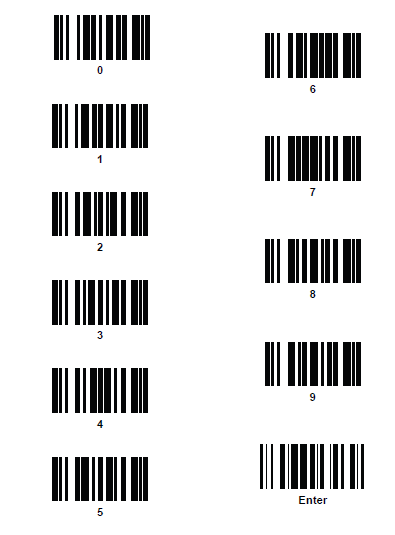 Scan the number barcodes below. After you scan the number code, scan the ‘Enter’ barcode to finish. The CS3070 user manual and quickstart guide can be found at www.dropbox.com/sh/e07lr9dwdfx3o5h/AACvsNXSq7Z_Xal54PzNlVB4a?dl=0.